Find best target date 2046-2050 mutual funds 2014. Top mutual funds are Invesco Balanced-Risk Retire 2050, Legg Mason Target Retirement 2050, Vanguard Target Retirement 2050, etc. Target date mutual funds are popular among long term investors. If you have an individual retirement account or 401k plan from your company, you might familiar with target date mutual funds. These funds invest in bonds and stocks. The assets are allocated based on your retirement age. For instance, if you choose a target date 2050 fund, you might find your mutual fund to invest more in stocks and less in bonds. The top performing list is sorted based on its YTD performance in 2014. Investors can find the review and other fund information such as expense ratio, fund manager, yield, turnover rate, sales load, top holdings, top sectors, etc. The investment objective for Invesco Balanced-Risk Retire 2050 Fund is to provide total return with a low to moderate correlation to traditional financial market indices. This best performing target date 2046-2050 fund has annual expense ratio of 1.36%. The dividend yield is 2.24% and is distributed annually. It uses Custom IBRR 2050 Index as its benchmark. Since the fund’s inception, it has a total of 5 years of positive return and one year of negative return. The best 1-year total return was in 2009 (27.92%) and the worst return in 2008 with -37.51%. The top holdings are Invesco Balanced-Risk Aggressive Allocation Fund (87.12%) and Invesco Balanced-Risk Allocation Fund (12.13%). 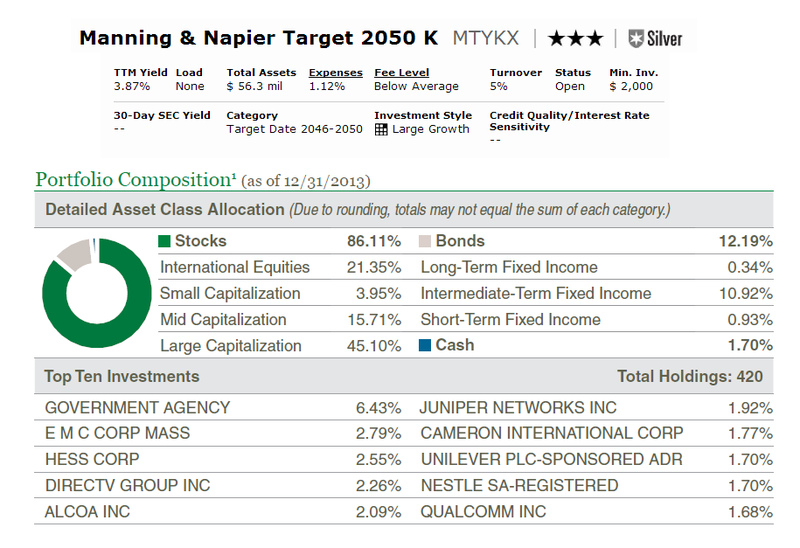 Currently, the portfolio of this Manning & Napier Target 2050 K (MTYKX) Fund is invested in an aggressive, growth-oriented mix of stocks, bonds and cash that seeks to earn the long-term growth typically associated with the stock market. The CUSIP is 56382P849. It has total net assets of $56.3 million. The annual expense ratio is 1.12%. Morningstar analysts rank the fund with 3-stars and Silver rating. The YTD return is 1.38%. This top performing target date 2046-2050 fund has 1-year annualized return of 18.01% and 5-year annualized return of 17.44%. The top investments are Government Agency (6.43%), EMC Corp Mass (2.79%) and Hess Corp (2.55%). This Legg Mason Target Retirement 2050 Fund is managed by Steven Bleiberg. It was incepted in 2008 and it seeks the highest total return overtime consistent with its asset mix. The yield is 1.40% with the last distribution in December 2013 ($0.20). The yearly performance of the fund since its inception is 29.35% in 2009, 14.69% in 2010, -3.60% in 2011, 15.92% in 2012 and 23.05% in 2013. The top holdings as of February 2014 are iShares Russell 1000 Value Index Fund – ETF (14.34%) and iShares MSCI EAFE Index Fund – ETF (9.76%). 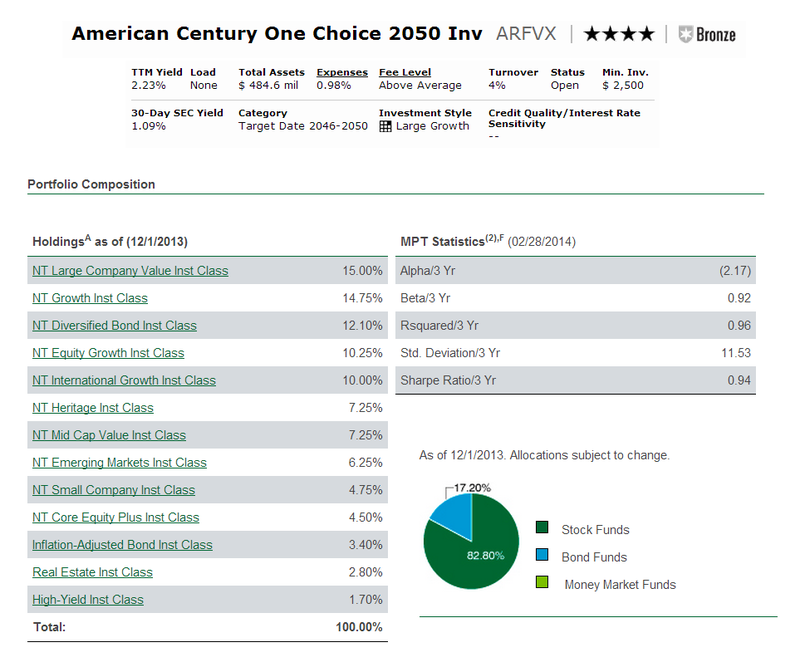 The American Century One Choice 2050 Investor Fund (ARFVX) has 4-stars and Bronze rating from Morningstar. The total net assets are $484.6 million. Its annual expense ratio is 0.98%, higher than the average ratio (0.51%) in the Target Date 2046-2050 Category. The fund distributes 2.23% yield. As of April 7, 2014, the YTD return of ARFVX is 0.73%. This best performing target date 2046-2050 fund is ranked in top 22nd percentile among its peers in the category. The top holdings are NT Large Company Value Institutional Class (15.00%) and NT Growth Institutional Class (14.75%). Among all the funds in the list, this Vanguard Target Retirement 2050 Investor (VFIFX) Fund has the largest total net assets of $6.6 billion. It also has the lowest expense ratio of 0.18%. This target date mutual fund uses Large Blend investment style. It has 1.81% dividend yield. Based on the load adjusted returns, this Vanguard fund has returned 18.46% over the past 5-year and 17.46% over the past 1-year. The fund uses Target Retirement 2050 Composite Index and Dow Jones U.S. Total Stock Market Index as its benchmark. The top asset allocation is in Stocks (89.58%).